Noah built an ark which saved his family from a watery grave. When they disembarked, God told them to be fruitful and multiply. Ultimately 70 nations came from their increase. Moses’ family built an ark which saved Moses from a watery grave. God had told Joseph to be fruitful and multiply. The 70 people grew into a nation which was too numerous to count. Ray continued with the theme of the stark contrast between the desert and Goshen. He showed a picture that was taken of him standing in a lush green field by a colleague who was standing about 20 feet away. Then Ray and the photographer switched places and another picture was taken. This time, Ray is in the desert and there’s not a green plant to be seen. The words in Egyptian are: ISFET = Chaos = Desert. MAAT = order = Green Fields. The worldview of the Egyptians was that wealth, power, order, and material things are what matters. Their statues and buildings were huge. 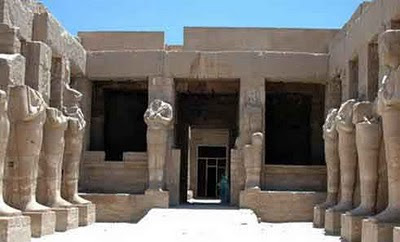 The temple to Amun Ra has huge doorposts. The lintel, or header above the doorway in their temple was huge. The question then becomes, How big is our God compared to that? Knowing that this sets the stage for the comparison sheds some light on certain Bible passages. Psalm 24:7-10 “Lift up your heads, O you gates! And be lifted up, you everlasting doors! And the King of glory shall come in.Who [is] this King of glory? The LORD strong and mighty, The LORD mighty in battle. Lift up your heads, O you gates! Lift up, you everlasting doors! And the King of glory shall come in. Who is this King of glory? The LORD of hosts, He [is] the King of glory. Selah"
The heads in this passage are the headers above the lintels. God is so big that the doorway has to be expanded to accommodate Him. Of course, this is purely poetic, but it was a boast nonetheless of the awesomeness of the LORD when compared to anything else. 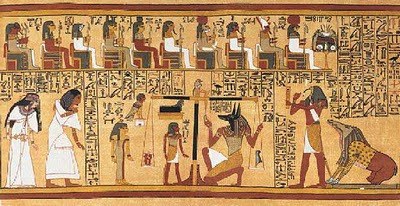 Ray then showed a picture of the Book of the Dead, which is a mural depicting how one gets to heaven in their cosmology. Essentially, going left to right, the jackal headed god of the dead weighs the person’s life, symbolized by their heart, in the balance. A feather is on the right side and the hope is that your heart is lighter than a feather in order to show that you are not a great sinner. If you make it, then you are escorted to heaven which is on the right side. With this in mind, when the Bible says that Pharoah’s heart was hardened, it is like saying that Pharoah is a sinner who will not make it to heaven. Thank God that we have a better process than this. Our sins have all been washed away and heaven procured with repentance and a word of faith in the finished work of Jesus the Messiah. Egypt is the story of 2 kingdoms in conflict. God is at war with the demons which are behind the Egyptian gods. The demons are real. Each of the plagues is an attack at one or more demons who are in charge of the item under punishment. (More on this next time). It is noteworthy that the ones who understood what was going on in Egypt were the magicians. They were manipulated by the demons and they knew their power; but they also knew the power of Moses’ God was greater. But it took longer for Pharoah to come to that realization. In a land where the carvings on the temples showed Pharoah’s strong arm raised with a weapon, the finger of God worked greater wonders. DK: Passover is coming in a few days and I look forward to sharing it with our family this Saturday. I hope that many of you can do the same. I hope too that our churches will mention the three festivals that make up the spring feasts as an important part of our heritage. Strictly speaking, it is not called Easter, but Resurrection Sunday or FIrst Fruits. It was not on a Friday that Jesus died, but most likely a Thursday just before the High Sabbath of Unleavened Bread when he was buried (remember the 3 days and 3 nights - just like Jonah).